Jack was determined not to be trapped in the black hell hole of the Deepcar mines like his father and finally, escapes to join the elite force of the British army, the Coldstream Guards, where he carries his father's boxing skills to the ultimate heights and then experiences a love and passion he didn't know could exist, changing his life forever. His love is left behind as his Division leads the British Expedition Forces off to a war to end all wars, facing unbelievable horrors. Trying to survive in an insane world of terror, slaughter and constant death. Annie was born in the poor house and raised in poverty, neglected and cast aside by her mother. Torn from her grandfather at a young age, the only person who had ever loved her, and raised in a Dr.Barnardo's home where death came to seek her. Fighting to survive and finally finding a love that could cost her her life. Two people whose lives were set on a collision course that was filled with loneliness, misery, pain and heartache, tempered by passion and love. Based on real people who laid the foundation for a new generation. Find out more when you read the first few chapters. Will it ever go away? I was captivated right from the very first few words, very intrigued as to what next was going to happen, and I eagerly and enthusiastically read the book cover to cover. 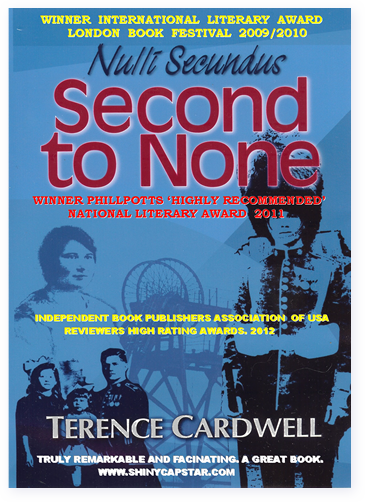 There are not too many books that cause me to complete the reading of them, but I found 'Nulli Secundus- Second to None' most exciting and uplifting to say the least. Others I know have read this book and they would heartily agree with my sentiments.... George Barton, Literary Critic. It is a truly remarkable and fascinating account based on factual information and details, people, dates, times and places which took over five years of research..... Shiny Capstar, the Portal for the Coldstream Guards. This page has been accessed times.